Red Riders Sports Club near Sarjapur Road is the adrenaline junkie’s place-to-be, with activities like go-karting, zorbing, paintball and much more. They have one of the longest go-karting tracks in the South of India apparently and one of the biggest two-way zip lines in India. Red Riders seems like a place to go with the most competitive bunch of friends you’ve got. Race them in a kart on their long go-karting track and channel your inner Schumacher or shoot them in a game of paintball — all of this is up for grabs here. If not the competitive type, you can always just have a ball in the zorb — on the pool. Or fly along the zip line — one of the longest two-way zip lines in India apparently. There’s trampoline bungee jumping, where you are ejected into the air and land on a trampoline, so bungee jumping is made easy. Try doing a flip for some extra brownie points. You could even try a hand at archery, target shooting, wall climbing and even take a shot at their rope course. They’ve also got a rocket ejector, where you get strapped up and get shot high up in the air. So what we’re saying here is, you’re a human slingshot. Now, how cool does that sound? Red Riders is stacked with things to do and activities to get your adrenaline pumping. Red Riders is a fun place to do plenty with family, friends or as a corporate outing. The go-karting starts at INR 413 for five laps and goes all the way to INR 1,121 for 18 laps. A game of paintball costs INR 350 for 35 bullets and the 2-way zip line is INR 350. 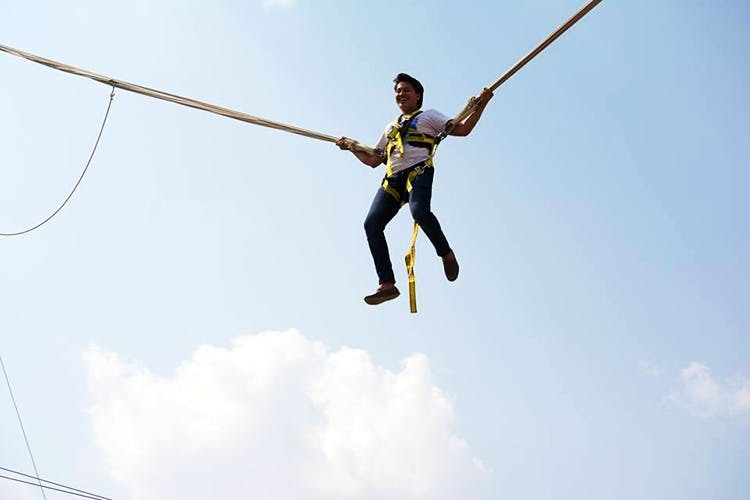 All other activities are priced between INR 150 and INR 500 and these include zorbing, archery, trampoline bungee jumping, rope course, wall climbing, and more.